Audio signals are voltages that move coils in speakers, which in turn push air to produce sound. But these audio signals start at low voltage levels and so require a series of stages of amplification to produce sound in speakers. A power amplifier drives speakers by amplifying what is called a "line level" audio signal on the order of 1 volt to voltages ranging from a few volts up to 100 volts or higher, depending on the power of the amplifier. The purpose of a preamplifier is to raise the voltage level of various audio devices up to line level. (Preamplifiers also usually allow the user to switch between different audio sources and include controls to adjust volume, tone, etc.) A number of devices - such as CD players, AM/FM tuners, tape players, VCRs, DVD players, and iPhones - already generate line level signals. But other devices generate lower voltage audio signals. For instance, a microphone typically generates a signal on the order of 1-10 millivolts. The typical (moving magnet) phono cartridge on turntables generate signals on the order of 2-5 millivolts. To bridge the gap between the output of microphones and turntables and the line level expected by a power amplifier, a preamplifier brings the level of the audio signal up to line level. I’ve been meaning to build a tube-based preamplifier for a couple years. In this post, I’ll go through what I built. But first, we should talk a bit about the audio signal from phonographs. Every phono cartridge has a stylus that is attached to the tip of a small tube, which is called the cantilever. In moving magnet (MM) cartridges, the cantilever is attached to a magnet. In a MM cartridge, when the stylus vibrates from the audio signal encoded in a record’s groove, the cantilever vibrates as well, which in turn moves the magnet. Coils inside the cartridge generate a small electrical signal when the magnet moves. This audio signal is on the order of 2-5 millivolts. MC cartridges tend to be more expensive than moving magnet cartridges, partly because of the technical difficulty of building tiny wire coils that the cantilever is attached to. (The coils in MC cartridges weigh less than the magnets in MM cartridges, which makes them better able trace the surface of a record groove, resulting in better accuracy and less distortion.) The (typically) low output of MC cartridges requires some means of “stepping up” their voltage output to a level similar to the output of typical MM cartridges. This can be done using active electronic circuits, but many people prefer to use a step-up transformer (SUT) to perform this function. The JE Labs Arkiv site discusses the sonic characteristics of some vintage step-up transformers that can be used for this purpose (http://jelabsarch.blogspot.com/2012/06/mc-step-up-transformers.html). 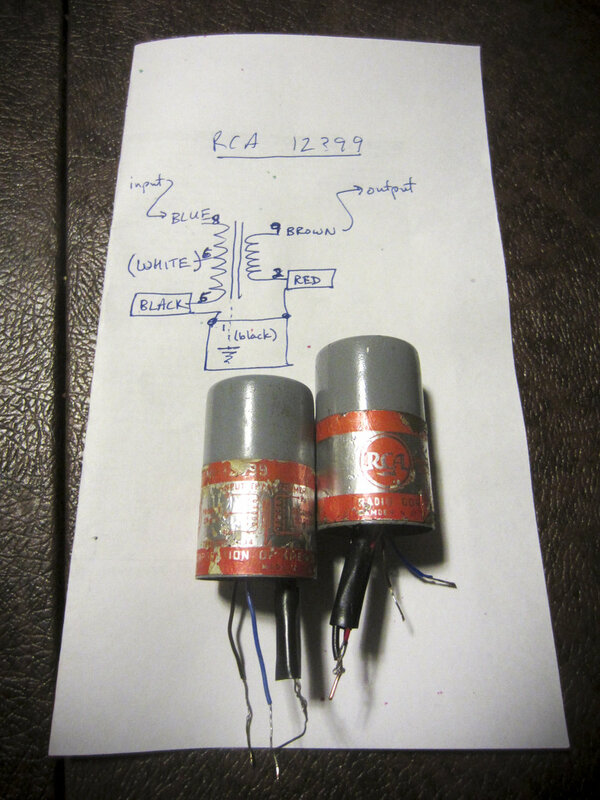 I like the sound of the RCA 12399 transformer, so I will use a pair of 12399’s that I got cheap because a former owner tried to rewire them for this project (Figure 1). I removed the bottom of the 12399’s because some of the pins on the bottom were disconnected from the transformer (Figure 2). Once we have the audio output voltage from a turntable in the 2-5mV range, we need to decode the RIAA (Recording Industry Association of America) equalization applied to the audio signal when the record was made. RIAA equalization is the industry standard for recording and playback of vinyl records that was adopted in the 1950’s. RIAA equalization is one of many possible schemes that reduces low frequencies and boosts high frequencies, which among other things allow records to play longer by decreasing the average width of record grooves—loud low frequency signals require more real estate in a record groove than high frequency signals do, so decreasing the level of low frequencies reduces the width of grooves needed for low frequencies. When playing a record, the RIAA equalization performed during recording has to be undone in order to retrieve the original audio signal. Otherwise, the lower frequencies will be very quiet and the higher frequencies will be very loud. For this project, I built a phono preamplifier with RIAA equalization using the basic design discussed on the JE Labs Arkiv site, which is itself based on the schematic in the RCA Receiving Tube Manual (1964); see schematics at http://jelabsarch.blogspot.com/2012/06/je-labs-phono-and-line-preamp.html. The RCA phono preamp schematic has an input gain stage that uses half of a 7025 tube (which is a low noise 12ax7 dual triode tube) followed by the RIAA equalization circuit (consisting of 2 resistors and 2 capacitors), which is then followed by a second gain stage using the other half of the 7025 tube. I agree with the JE Labs Arkiv site that older, larger octal tubes often have better bandwidth and depth compared with the more modern 9-pin tubes with similar characteristics (like the 7025/12ax7), so I started with a design from the JE Labs Archiv site using the 6SL7 tube, which has only slightly lower gain characteristics compared with the 7025/12ax7 tube. (The 6SL7 has a gain factor of 80, whereas the 12ax7 has a gain factor of 100.) So for each stereo channel, my phono preamp design had an input gain stage using half of a 6SL7 tube followed by the RIAA equalization circuit followed by a second gain stage using the other half of the 6SL7 tube. Instead of spending a lot of time deciding on a power supply design strategy, I decided to follow an innovative way to reuse switch-mode power supplies (SMPS), such as those used for laptop computers, as the power source for this project. (I got this idea from Greenvalve Audio, who used multiple Cisco 48vdc SMPS power supplies to obtain the high voltages needed for tube amps; see https://greenvalve.wordpress.com/category/audio-schematics/.) One advantage of using SMPS for power supplies is the voltage will not fluctuate depending on changes in AC line voltage (which can vary between 110-130vac in the U.S., even in the same house at different times of the day) or on the load of the preamplifier. Caveat: You have to use a good SMPS. First, it does in fact have to have steady DC voltage output that does not change under load or with changes in AC line voltage. Second, make sure that the earth ground connection of the three prong power cord is not connected to the 0vdc connection of the DC voltage output since we will be “stacking” multiple SMPS in series. If the earth ground connection of the three-prong power cord is connected to the 0 volt connection of the DC voltage output, then this will short the stacked SMPS. I learned this the hard way…. To stack the SMPS, I built a small box that put the voltage output of twelve 48 volt SMPS in series to generate 6 x 48v = 288v per channel, which is very close to what is needed for the preamplifier (Figure 5). I also found a 7.5vdc SMPS – adjusted to provide the 6.3vdc required for 6SL7 and 6SN7 tube filament heaters – to use for the tube heaters. One day, I will put the power supply in a separate box that I will build. For now, I put all the SMPS and power strips inside a large cardboard box so I could carry the power supply around easily. Here is a picture of that box, with the preamp, a digital-to-analog converter (DAC), and the Edirol analog-to-digital converter on top of it (Figure 6). 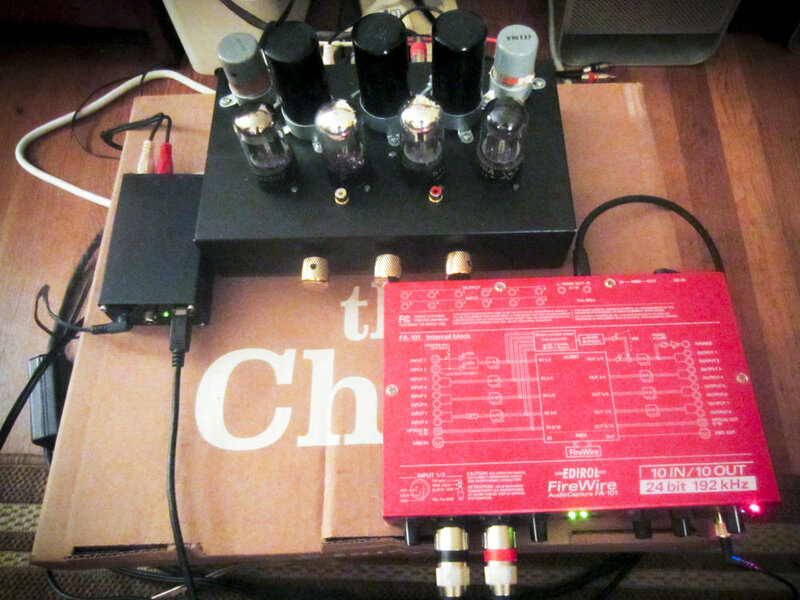 The tube preamp worked on first try. But the gain was too high for the Denon 103r moving coil cartridge I used with the RCA 12399 SUT. This may have been because the RCA 12399 SUTs boosted the signal more than needed. Instead of changing the SUT, I replaced the pair of 6SL7 tubes in the phono preamp with another pair of lower gain 6SN7 tubes. This adjustment worked well, and allowed me to use some nice 6SN7 tubes that I have for the phono preamp, namely, military spec Sylvania 6SN7wgta tubes, which I like. The next step is to make some digital recordings using the turntable, preamp and analog-to-digital converter…stay tuned.